Nominations for the All-Star Mile close on January 15. The public will then have the chance to vote for their favourite horses to gain a start in the world’s richest mile race to be run annually across the three Victorian metropolitan tracks. The popular So Si Bon is among the 25 stable nominations for the $5 million All-Star Mile (1600m). Having ended an 831-day drought with MRC Lord Stakes victory on Boxing Day, So Si Bon could be given a crack at the race. Other Lindsay Park nominations include Gr 1 sprinters Redkirk Warrior and Vega Magic as well as British stayer Muntahaa and Australian Cup winner Harlem. Redkirk Wariror was a winner over a mile at Sha Tin in 2015 , having begun his career in England with a debut win over 2020m at Yarmouth, before winning his second start at Ascot over 2012m. 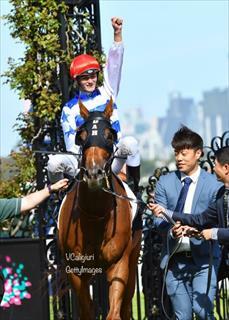 He also ran over 2000m in the Hong Kong Derby of 2015 before heading to Australia to Lindsay Park. At just his second Australian start Redkirk Warrior won the 2016 Sandown Stakes over 1500m beating dual Gr 1 winner Stratum Star and at that stage it looked like he was destined for middle-distance trips. Vega Magic, although never tried over a mile, he was an impressive winner on the Gr 1 Memsie Stakes (1400m) in 2017 when he led all the way.